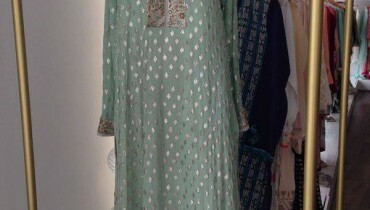 Zubaida Textile Mills recently launched “Misha Embroidered Khaddar Collection 2014″ that looks fit for winter season, holiday observance, lunches and parties formal afternoon tea for urban women. Misha Embroidered Collection 2014 by ZTM comprises about 4 Piece Khaddar Suit with Khaddar Dupatta,1 Meter Sleeves, Embroidered Panel & Neck, 2 Meter Gold Border, 2 Meter Khaddar Border, Plain Trouser. ZTM is not a new name in the fashion industry, is one of the oldest textile manufacturers are providing gorgeous and stunning designs to its customers over the years for all seasons. In his latest collection 2014, they are offering a vintage feel with contemporary fashion that will make you elegant ultra modern and give you a sense of pride in the season. Zubaida Textile Mills always provide customers with the most fashionable clothes and always gives a new look with offering these beautiful dresses. This is why the popularity chart of ZTM is increasing day by day, making them work harder. Hand work creation embroidery you see on the front and back of the shirts, printed edges and sleeves. Her dresses are highlighted with solid and pastel colors. 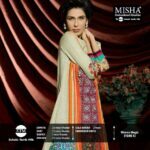 Misha Embroidered Collection 2014 by ZTM comprises about 4 piece suits including beautiful long shirts with chiffon dupatta, sleeves and pajama / shalwar combination, most have offered dresses with chiffon sleeves and collar is embroidered almost every shirt that looks awesome. ZTM have offered this collection that is elegant, bright, ultra chic and perfect for you.